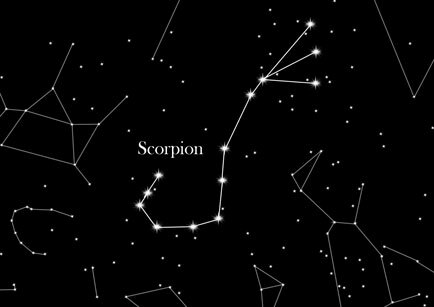 The Scorpion is a rather conspicuous constellation. It is close to the center of the Milky Way and also on the plane of the ecliptic as one of the 12 zodiac signs. Due to its bright stars lined shears and the scorpion-typical curved sting this constellation is relatively easy to spot in the sky even for beginners. The brightest star of the scorpion was also called Qualbu’l-Agrab - “Heart of the Scorpion” by the Arabs due to its position. The Greeks had an interesting name for it as well: Antares (antares) – which means “Counter-Mars”. The name comes from the red colour of the star and the fact that Mars and “Counter-Mars” don’t meet each other often in the sky. Once you’ve found “Counter-Mars” you will be able to recognize the shears and the sting of the scorpion that is sticking up. Unfortunately you can only see this constellation during the summer and even then it’s incomplete because of the very southern sky position. In order to make the king’s daughter, Merope, his wife, the experienced hunter Orion had to free the island of Chios from all wild animals according to mythology. He was unable to do so despite all his experience, so the king did not allow him to marry his daughter. Orion got very upset about this, and he wanted to kill all the animals in the world. This made Gaia, the Earth Goddess, very scared. She sent out a small, but dangerous scorpion to stop the extinction of all animals and Orion from causing any harm. The Goddess of the Hunt, Artemis, liked Orion and wanted to shield him from his ruin. She solved the conflict in a simple manner. She placed both of them on opposite ends of the firmament. Even today Orion and the Scorpion stay far away from each other in the sky – you will never see them at the same time. Astrological significance: People born under the Zodiac sign Scorpio are strong-willed and self-confident. Being very passionate they can become jealous and vindictive. They are very honest and sincere and can help people with that, but hurt them as well. The Scorpion’s element is the water.